Are you considering a career in health care? Through Pottstown Medical Specialist, Inc. (PMSI) Job Shadowing Program, you can get a unique, up-close view of what it’s like to work in the health care field through our job shadow programs. During the job shadowing experience individuals with or without prior medical education can observe medical professional at PMSI. The application review process will take approximately 7 days. Once the application is approved the participant will receive an approval email from Human Resources. Applications will not be reviewed unless all information is completed on the required job shadowing application forms. PMSI has reserves the right to refuse a request for any reason. Students between the ages of 16-17.5 will observe PMSI Medical Staff through the eyes of the Front Desk Administrative staff, Medical Assistant and our Office Managers. This shadow experience is meant for observation only; it may not include any other type of interaction with patients. Students will observe and learn and understand the strong importance of developing a strong health care workforce for the future. This shadow experience must not extend beyond 24 hours. Students or persons 17.5 or older must be a senior in High School or currently enrolled in an accredited college and considering a career in healthcare. Through this shadow experience individuals with or without prior medical education can observe medical professionals as they care for patients and families for at PMSI. This is experience is meant for observation only. This shadow experience must not extend beyond 40 hours unless approved prior to the start of the shadowing program. An individual wanting to shadow must be 16 years of age or older. Participants must arrange with the locations Officer Manager to job shadow at a mutually agreeable time. Participant must complete a job shadowing application form and submits it to PMSI Human Resources Department. The Participant must complete HIPAA training. Alternatively, if the student has taken HIPAA training at another institution, he/she must provide a certificate of satisfactory completion. Each Student must sign and/or provide copies of the following documents. (1) Confidentiality agreement; (2) the shadowing liability release form; (3) shadow agreement; and (4) emergency contact form. Participants must obtain an identification badge. Flu vaccination when shadowing between months of November and April or when required by PSMI. The participant completes all required HIPAA training prior to his/her first day of shadowing. Participants will not be granted access and must agree not to attempt to gain access to PMSI network resources. During shadowing experiences, participants may come in contact with very sick and/or contagious individuals and with hazards. Job shadow participants must accept the risk of any illness, injury or harm that result from participating in the job shadow experience. Before the participant observes patient care, the sponsoring provider must obtain verbal permission from the patient or patient’s representative. It is strongly recommended that the provider make a note in the chart to document that permission was given. Participants must understand that if you encounter a friend, acquaintance or family member during a shadow experience with PMSI, he/she must keep this information confidential and not disclose this information to any other person. Participants may not obtain educational credit for the experience and will not be graded. Job shadowing experience shall be observation only. Participants may not provided patient care or engage in any direct patient contact (verbal or physical) with patients. PMSI first priority is to protect the health and welfare of it patients and staff, at any time PMSI staff may requires a job shadowing participant to leave the area or office location. *If the participant is 18 years or younger, a parent and/or guardian signature is required on all documents prior the acceptance into the shadowing program. Please see forms below that are required. 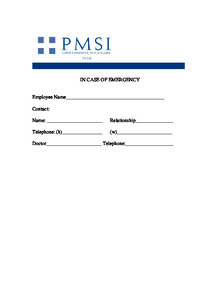 Download "Job Shadowing Liability Waiver"
Download "Job Shadowing Emergency Contact Form"